When Verdugo Hills Hospital added USC to its name five years ago, Keck Medicine of USC made some ambitious promises about its plans for the facility, long considered something of a local treasure. 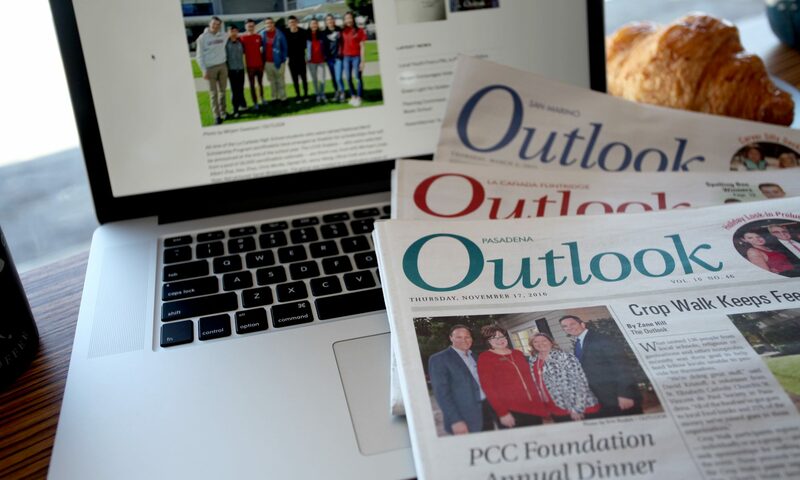 Thomas Jackiewicz, Keck Medicine’s vice president and CEO, predicted then that the new partnership would “leverage the strength of both organizations” in the following five years through an expanded network and investments of $30 million. 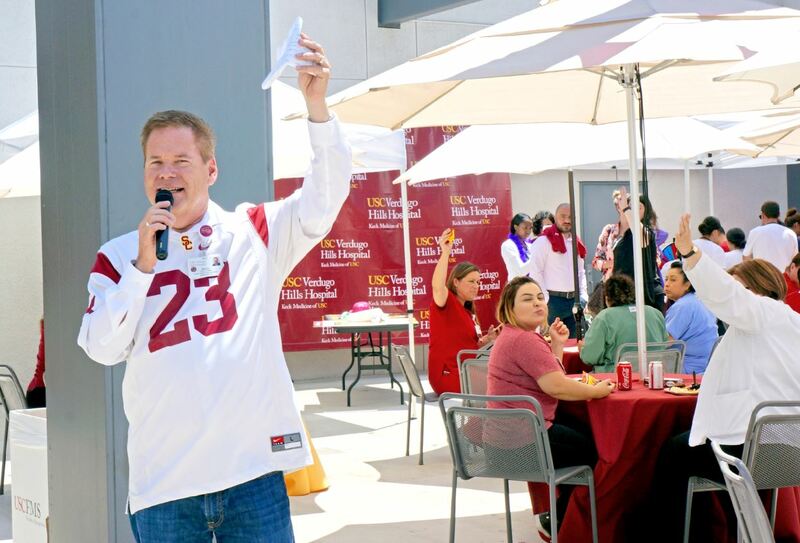 At a staff barbecue last week on the hospital’s terrace, members of the USC Verdugo Hills Hospital team — most of them dressed in USC’s cardinal red — said they were celebrating the realization of many of those goals. According to hospital CEO Keith Hobbs, Keck Medicine has spent $35 million on the hospital, which boasts a new neonatal intensive care unit, updated technologies and a significant influx of patients, who are registering a higher rate of satisfaction with the services they receive. 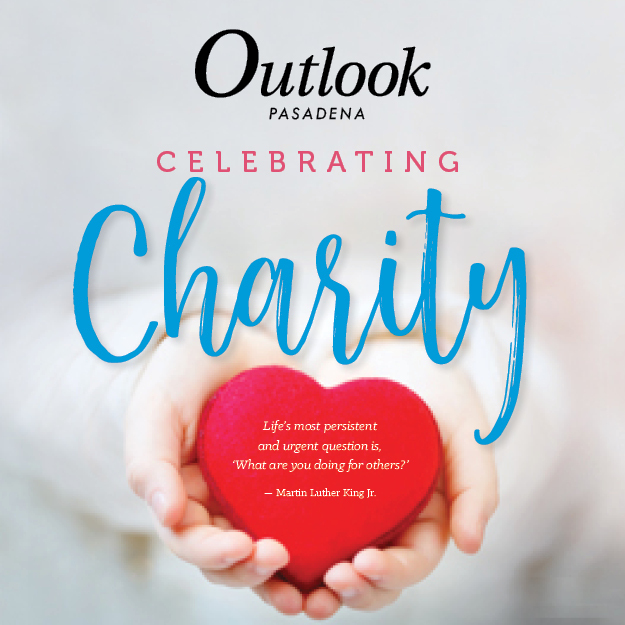 “It’s been an amazing change,” said Chloe Roland, a 1992 La Cañada High School graduate who works as registered nurse in the emergency department. “Everybody loved Verdugo before because it was a community hospital, and it was home, but then it started suffering financially. 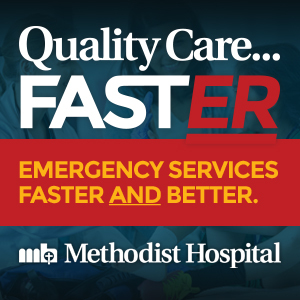 Hobbs boasted of improved quality of care, saying that USC-VHH has reduced its “harm events” by more than 35% and established a respectable door-to-doctor wait time of 28 minutes in the emergency room — which received 26,000 patients in the most recent fiscal year, an increase of about 10,000 from the year before USC took over ownership. Also in that five-year span, the hospital’s “head-in-a-bed count” has risen to about 100 each night from the previous average of 60, Hobbs said. Financially, the hospital has experienced a $19 million annual improvement, said Hobbs, who grew up in La Crescenta and arrived at USC-VHH in 2016 after 23 years at Children’s Hospital Los Angeles. 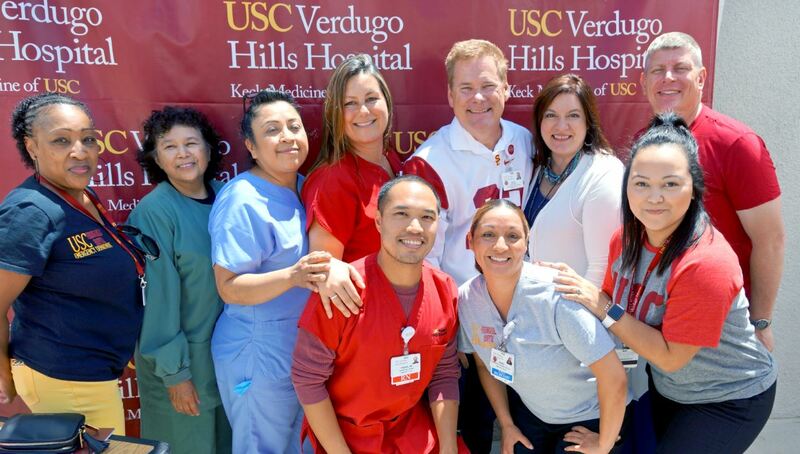 Hospital staff members commemorating five years under the Keck Medicine of USC umbrella include (front row, from left) Pierre Ebreo, Jenny Olivas and Vanessa Martinez. Back: Eunice Ramirez, Pat Albanes, Luz Ojeda, Chloe Roland, CEO Keith Hobbs, Jessica Thomas and Kenny Pawlek. There were early growing pains after the acquisition, including testy negotiations with the hospital’s nurses, who complained of staffing shortages and what they considered unsafe working conditions and balked at the number of temporary traveler nurses cycling through the facility. But in the past few years, the hospital has expanded its nursing staff as it began offering more competitive wages, as well as USC tuition remuneration for staff and their family members. Those efforts quelled concerns, it appears. Recent surveys indicate staff morale is much improved, according to Hobbs, who also boasted that members of each department have had fun lately starring in a pair of lip-synced music videos, including one to Michael Jackson’s “Beat It” that was playing on a loop last week at lunch. “We went three consecutive months in the fall where we had absolutely no travelers,” said Hobbs, noting that the streak was interrupted when the hospital brought in travelers to cope with the worst flu season in the past decade. The new NICU, which opened in March, has proved an immediate success, according to the CEO. USC-VHH also has adopted new technology to fight germs in its facility, employing Xenex, a robot that disinfects hospital rooms in minutes. Other technological advancements include a Vinci robot that performs minimally invasive surgeries. There’s also a reliable electronic medical-records system that links all of Keck’s facilities. Hobbs said he’s committed to maintaining the community feel of the hospital, with its members making appearances at the Crescenta-Cañada YMCA, the Thursday Club and La Cañada Presbyterian Church in addition to hosting regular health-care classes on site at little or no cost to the public. In surveys and on post-visit calls, patients indicate they appreciate the hospital’s service, said Pierre Ebreo, a registered nurse. In the next five years, Hobbs said, the community can expect more enhancements, including the expansion of the emergency department and the construction of an interventional radiology cath lab and a new medical office building that will function, in part, as an ambulatory surgery center and endoscopy center.